Lizzie Peyton has been a dear friend of mine for many years now! She is a fabulous chef up in Big Sky and when she decided to build her own home she needed a space that was fit for her needs as a personal chef. The kitchen is where she started - a full commercial kitchen including 4 burner Capital stove and 24 inch griddle, several ovens including a Moffat Turbofan, and an industrial size Marvel refrigerator all done by Bridger Kitchens. The home has an open floorplan perfect for the entertainer in Lizzie. The entry, great room, kitchen all flow together seamlessly. 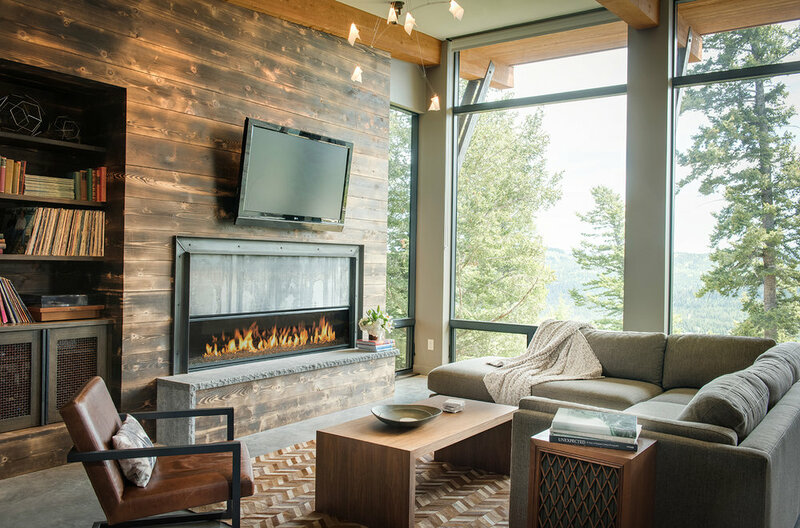 The large windows open up to the spectacular views of the surrounding mountains. One of my favorite touches is the ice basin built right into the counter! All the details including the reclaimed timber, birch wallpaper, and stonework accents make the home truly custom. The exterior is charred cedar using a traditional Japanese art called Shou Sugi Ban. It wouldn’t be a beautiful mountain home without a killer deck. This deck is incredibly special as it has a hydraulic garage door that opens the space up to the dining room and kitchen completed by Crown Industrial Doors. Lizzie and the team from Reid Smith Architects and Big Sky Home Builders did an amazing job on the home and it was a blast to photograph. The entry opens up to this stunning great room. Sometimes it's all about the details! This kitchen in AMAZING! The ice basin built into the counter was a very nice touch. I love the garage door that opens the dining room right out to the deck. The walls and windows are spectacular in the master bedroom. The perfect mixture or birch wallpaper, timber, and stone. This home is stunning from all different angles. Here you can see the large deck and fireplace. The lower level is a greenhouse and wine cellar. Pretty amazing!